As development for energy resources picks up in the Delaware Basin, HGA’s field survey and GIS teams continue to provide quality property plats and construction alignment sheets for Anadarko. With our procedures for gathering field data and integrating data with our GIS-based software, we continue to reduce man-hours by preparing plats more efficiently and creating higher quality alignment sheets with ease. During Anadarko’s Reeves County buildout, HGA has achieved nearly 40% savings in man-hours as compared to traditional methods for issuing the survey deliverables. Over 540 plats, 530 alignment sheets, and 200 piping drawings were prepared to support the construction efforts that began in early August. As with any large gathering system, Reeves County had its share of line changes, re-routes, and design modifications. (Most of these are due to landowner negotiations and drilling schedule changes.) HGA’s and Anadarko’s project teams worked hand-in-hand to ensure that all of the changes were communicated, schedules adjusted, and all deliverables were updated accordingly. HGA currently has numerous as-built survey crews on site assisting throughout the construction phase of the project by staking the limits of construction, centerlines of the pipelines, and additional workspaces. These crews also maintain detailed geo-referenced records of all pipe, valves, and fittings from the time they arrive on site until they are installed and buried along the right-of-way (ROW). This data will all be submitted to Anadarko within as-built geodatabases to be loaded into their PODS system for final project documentation. Due to our performance and dedication throughout the Reeves County buildout, HGA was selected to perform the same scope of work for Anadarko’s Loving County buildout. 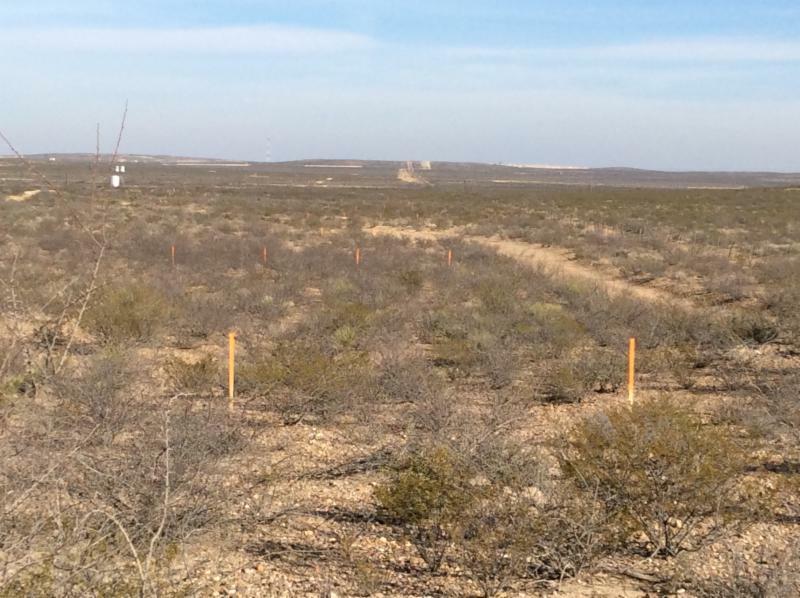 Very similar to HGA’s scope in Reeves County, the Loving County buildout includes over 200 miles of pipelines ranging from 4- to 24-inches to gather and transport oil, LP gas, HP gas, and produced water. HGA began the field alignment surveys in Loving County in mid-August and the majority of the lines were completed by the end of October. The remainder to be surveyed are awaiting landowner negotiations. As we await guidance on these final lines, our designers are hard at work producing property plats, alignment sheets, piping drawings, and geodatabases. It is estimated that HGA will prepare approximately 320 plats and 550 alignment sheets utilizing our GIS-based processes, as well as approximately eighty piping drawing packages. All of these tasks are currently due to be complete by the end of January, pending any modifications due to re-routes and so on. Our clients continue to look to HGA to provide value and dedication, resulting in stronger relationships and repeat business.